Thames Discovery Programme - Richard III and the River? Richard III and the River? With all the excitement today about the identification of the remains of King Richard III (also known as “The King in the Carpark“), here’s some information about another wonderful find made by Woolwich John on the Thames foreshore and reported by the Portable Antiquities Scheme late last year. The copper-alloy mount in the form of a boar shows the animal chained, collared and wearing a crown with a heraldic crescent above one of its legs. it is wonderful to have a London find associated with the king. 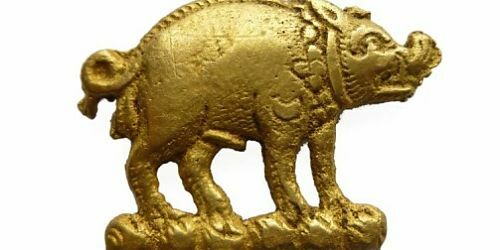 The mount is very similar to a number of boar badges which have been reported Treasure over the past few years, which were made for followers of Richard III (of York), as Duke of Gloucester, during the Wars of the Roses. Richard took the white boar as his sign; ‘bore’ may have also been an anagram of Ebor, the Latin for York”. 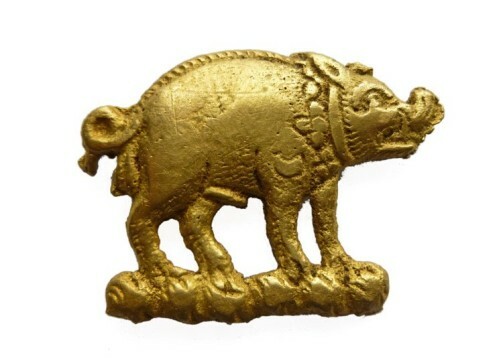 Badges in the form of a boar were ordered for use at Richard III’s coronation (in July 1485) and also for the investiture of his son, Edward, as Prince of Wales (in September). However, it is not certain what the mount from London came from, maybe a piece of furniture or was used to decorate an item of leather once owned by a supporter of Richard III, or possibly even the king himself. You can read more on the Thames and Field website, and the PAS detailed report on the artefact can be found here.